Planning for the 2018 Nuffield Alumni Biennial Conference is well under way. We appreciate that the get together of alumni is only every two years and an important networking and learning opportunity. We want to ensure alumni put the dates in their diary early as missing an event means a four year gap between conferences. 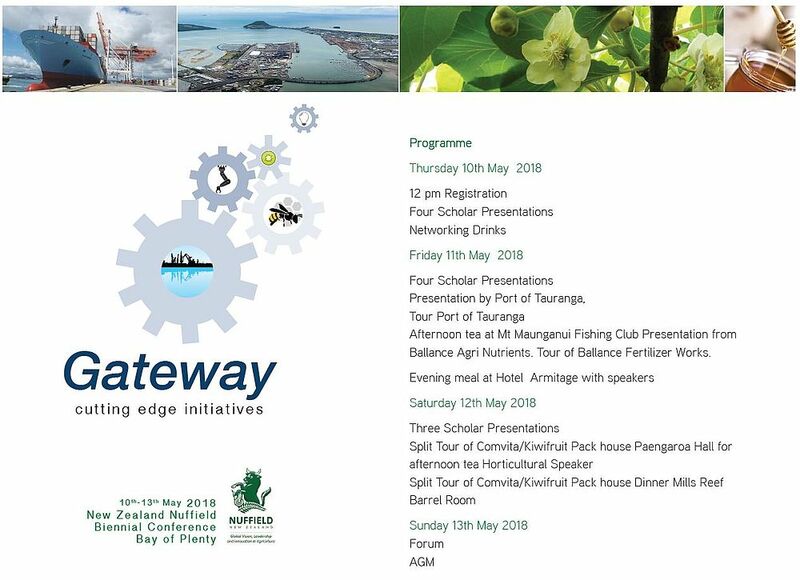 The Bay of Plenty is thrilled to host the 2018 Conference and showcase the region and its primary industry strengths, given we are home to some major producers and exporters. We hope to be able to show examples of the full supply chain during the programme. We also look forward to the presentations of the 2016 and 2017 scholars who have some very relevant and thought provoking topics. Our organising group have been working hard on a programme that will provide insights into the full supply chain and some of the horticultural strengths of the region. Planning is well underway with the programme and we will be organising pre & post Conference opportunities for those who have special interests. Registration will open early in 2018 with further information on accommodation, flights, venues etc available in October!! MAKE SURE YOU HAVE THE DATES IN YOUR DIARY NOW. Don’t miss our two yearly get together and presentations from recent Nuffielders.